Arias sobbed in the courtroom as prosecutors presented evidence. Jodi Arias could face the death penalty, nearly five years after she stabbed, shot and almost decapitated her ex-boyfriend. A jury Wednesday found that Arias was "exceptionally cruel" when she murdered Travis Alexander in 2008. 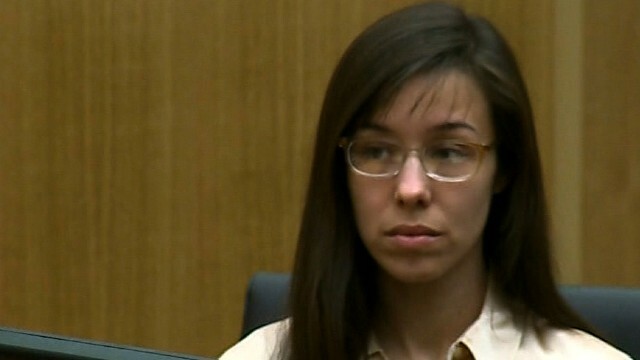 That verdict is a key step that makes Arias, 32, eligible for the death penalty in the next phase of her trial. Lol no i dont like pizza and am alergic to mushrooms. This murderer could get this, or could get that. This murder might serve this, or might serve that. Oh, that part of the murder trial will be detained another six months. The Devil made them do it so we might see an insanity plea emerge. Order in the courtroom! Order in the courtroom!!!! This witness was charged with perjury. That witness has no credibility. Oh my, this trail for murder will re convene "next year" at this time. We want to make sure this person is not discriminated against, even if thier guilty as sin, so lets take 'em to Orange Lobster. Ewww, the glove don't fit. The shoe doesn't fit. Skirts too big. Pants too small. Wow plan on copping the truth for another life sentence of taxpayer misery. SHOULD WE PERHAPS REFLECT ON ANOTHER TEN MILLION EXCUSES WHY ANY MURDERER SHOULD BE SPARED? Go to fox and don't come back. Big Shiz: Oh really. And some should just plain go to hell. That's the problem with the death penalty in general, no matter how terrible something is that someone did, unfortunately – they're still a human being. When it's a pretty young woman, that reality is much more apparent, however that reality is, fact in every case. When we a society, drool in vengeful lust in putting someone to death, for a horrible crime, it says more about us, as a society then the – wrongdoer. We letting our animalist, mob – hysteria mentality take control of our better judgment. Separated from society , yes – let them live a life of working to sustain themselves, and not being a burden on tax payers – in some prison in Alaska. But let's not, degrade to – this theatric slaying of people, like some roman stadium with the crowd cheering. There's a point of morality to consider here. As much as we don't want to think about it, once a murder is in custody, they are completely at the will of the captors, vulnerable alone, and scared to death, and again they are human – regardless of what they did, it's just an inescapable fact.